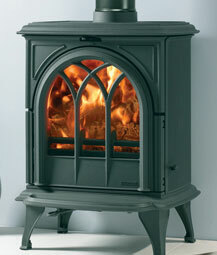 The Huntingdon 28 stove is an elegant piece of furniture in its own right. It has Gothic door mouldings and is complemented by reeded side panels. When lit, the latest advances in stove technology allow you to enjoy the flames to the full. You can also precisely adjust the flame picture via dual air controls.